Wolves, ocelots and several other creatures can be tamed if you perform several non-complex actions. But what if you want to tame a wild enderman that attacks anyone who comes too close? 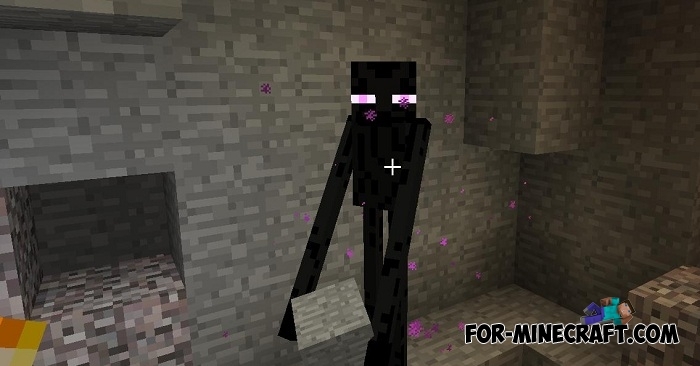 Endermen are not like other mobs, they are able to teleport and steal blocks when you are busy with your own affairs. Find a wild enderman (they live everywhere) and put the pumpkin on your head. This can protect you from aggression, the enderman will not attack you as long as the pumpkin is worn on your head. Then offer him a bow which is his favorite item. After the enderman is friends with you, you can go home. Your companion will follow you and repel attacks of opponents if you get into an unpleasant situation. Your enderman is no different from the wild ones, but now your life is very valuable to him. How to install the Friendly Enderman addon? Colorful Wolves (+More Wolves) (Minecraft PE 1.2)Minecraft PE contains many different dyes with which you can change the color of some items. Surely you will be interested..